This brief tutorial should get you up and running with EZLeaves. First thing you need to do is install the application. Download and run the installer. This will create an EZLeaves shortcut on your desktop, and also one in the Start>Program Files\EZLeaves\ folder. The Laurel Leaves area shows the laurel leave image. You can change the style of this area by selecting a different style using the drop-down box labeled Laurel Leave Style in the General Options section on the right. The grey lines you see in the image represent the borders of each line of text. Hovering the mouse over these lines and clicking on them allows you to resize each line of text on the image. Clicking on each area within the image will focus the associated edit field in the Number of Lines area. The Number of Lines area allows you to define how many lines of text you want on your laurel image. You can specify anywhere between 3 and 10 lines using the drop-down field labeled Number of Lines. As more lines are selected, their associated fields will be enabled and you can type text in them. As you type in these fields, the text will appear on the laurel image. When this field is checked, selecting a system-defined Font from the drop-down list below it will change all the fonts on the image. Un-checking this option allows you to define a different font for each line of text on the image. Selecting the font drop-down box and using your mouse scroll wheel to iterate through all of your fonts is a quick and easy way to see which font looks the best. Similar to the Master Font field, when this field is checked, selecting a color from the drop-down list below it will change the color of all the fonts on the image. Un-checking this option allows you to define a different font color for each line of text on the image. 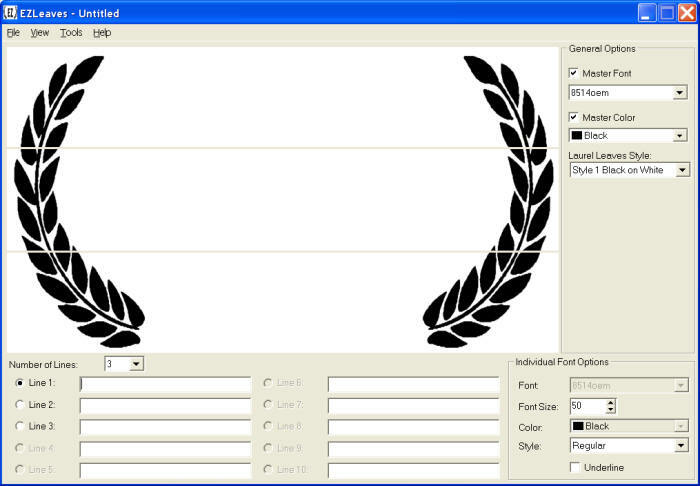 This option allows you to select from the 4 basic styles and colors of laurel leaves. Open - Allows you to open an existing EZLeaves template file (*.ezl). Save - Allows you to save the current EZLeaves image to a template file (*.ezl). Exit - Exits the application.. Preview - Allows you to toggle viewing the current image with or without the grey lines in the Laurel Leaves area. Image Size - Allows you to define the height and width of the resulting image file. If the Maintain Aspect Ratio is checked, any numbers typed into the fields will automatically adjust the other based on the original aspect ratio. Image Type - You can select to export to JPG, BMP or GIF. 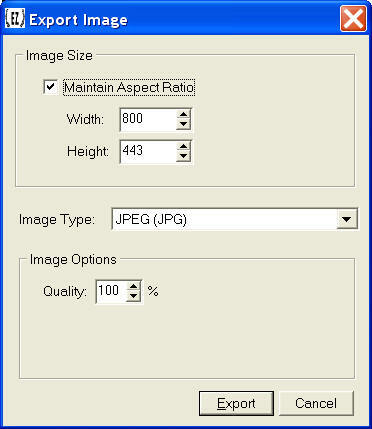 For exporting to JPG, you can specify the Quality percentage (1-100%) in the Image options area. If you export to BMP, you can specify the bitmap format (24 Bit, 256 color, 16 color, Black and White). If you export to GIF, you can specify whether or not the image is transparent. NOTE: Changing the options for each image will affect the image's size and quality. Show last opened image on startup - With this option enabled, the last image template file (*.ezl) that is opened will automatically be opened the next time EZLeaves starts. Default Path - Allows you to select a folder that acts as the default folder for all save/open/export dialogs. Online Help - Displays the help page you're currently reading. About EZLeaves - Shows the About box for EZleaves. Each line of text on the image has its own individual font settings. Clicking on each line of text will display the font settings for each line in this area. With the Master Font option disabled, you can define a different font for each line of text. This is where you define the size of the font for each line of text. You can use the up and down arrows to increase or decrease the size, or just type a size into the field. Alternatively (and possibly easier) you can change the size of the line of text by hovering your mouse over each line in the Laurel Leaves area and spinning the wheel on your mouse (if you have one) up and down. With the Master Color option disabled, you can define a different color for each line of text. This option allows you to set the text to Regular, Bold, Italic or Bold Italic. This option will underline the text in the Laurel Leaves area. To easily change the size of the font on each line, simply hover the mouse over the line in the Laurel Leaves area and use your mouse scroll wheel. To easily and quickly see how all of your system defined fonts look on the image, enter your text in the lines area, then select the Master Font drop-down list. Use the mouse wheel to scroll through all of your defined fonts and see how they look applied to your image. If the font you're using is spaced oddly, use extra lines as spacers. Just set the number of lines to 1 or 2 lines extra, then size those extra lines by hovering your mouse over the grey line to size them to the desired height. This should in turn move the lines above or below it, hopefully providing the correct spacing. Clicking on each line in the laurel leave image area will focus its associated edit field. Do you have a great idea for a feature to include in EZLeaves, or maybe you found a bug that is preventing you from using it? Send an e-mail to ezleaves@moviesbymartin.com with your feature request or bug report.